#KnitPetiteProject: Are there general rules we can follow for patterns we want to modify to our personal petite-ness? Get out those sweater patterns again, because it’s week 2 of our very practical look at modifying for our personal petite-ness! I’ve selected Winter Doldrums from Knitty to act as my example for this set of practical posts; I suggest that you follow along with your own selected pattern, and talk about it in the #KnitPetiteProject Ravelry group here. By now in the #KnitPetiteProject you should have a good idea of your body shape + size (using tools like a body graph, measuring our bodies, looking at sizing charts) and fit preferences. As each of us (and each pattern we select) will be different and offer up so many variables, we have to be thoughtful about determining any general modification rules for our knitting patterns. be willing to learn through doing! Below, I’ll go over each of these steps using my selected pattern for this exercise, Winter Doldrums. We’ve gone over this a bit in the #KnitPetiteProject, particularly in February. Recently, we also discussed the value in creating a body graph. I certainly understand the desire to have the internet hand you a perfect list of what you need to do each time you assess a sweater to knit (and I’ll give a small one below! ), but I’ve noted accurate body measurements first on this list because a rundown of general rules for petites may actually set you on the wrong track and cause frustration if you aren’t already aware of your own body’s shapes and sizes. Imagine if I had a broad back, but a short armscye depth. A “general rules for petites” might suggest something quite helpful in shortening my armscye, but would also tell me to narrow the back – that would cause some big time frogging when I realized it was super tight around my shoulders/upper back! This advice will give you a general sense of how your body is shaped vs. how many (but not all) patterns will assume it’s shaped. Knitting designers use all sorts of different sizing charts; some develop their own unique charts, some purchase (relatively expensive) charts, and some use free and accessible charts that anyone can take a look at online. If you know what chart the designer used, then that’s going to give you the most accurate info. But sometimes you just don’t have this information at hand. My suggestion is to take a peek at two of the most common (and freely accessible) charts that knitting designers use, and that we’ve talked about a lot here on the #KPP: the CYC charts, and Ysolda’s charts. Let’s do that together using myself as an example. Follow the CYC’s guidelines for measuring and compare your own measurements to their chart to create your own sizing layout like I’ve done here. Here’s Ysolda’s chart, which as you can immediately see is much more detailed than CYC’s. I’ve filled in most of my measurements, so you can see that Ysolda’s and CYC’s are both different from each other, AND different from me. We touched on this last week. Hop on over to that post for a more detailed look at some examples of different sweater and sleeve constructions. Here I want to bring your attention to the fact that with general modification rules, you have to keep in mind that some sweater constructions function in a particular way to give you the style/shape and freedom of movement you see in the photo. For example, with the information I’ve gleaned from the charts above, I can have a general modification rule that I need to shorten the sleeve depths on my sweaters. But, if I applied this to a set-in sleeve cap without considering that I have to equally adjust the body of the sweater itself, I’d end up with a sleeve cap that’s too small and incredible frustration all around. To use the lovely Winter Doldrums as another example: this bottom-up, in the round yoked sweater. If I wanted to achieve the relaxed look of the sweater in the pattern photo, I’d have to consider the fact that while my body measurement tells me my sleeve depth is 6″, I’ll want to add some length to that. Otherwise, the yoke will sit further up in my armpit (possibly in an uncomfortable way!) and restrain my freedom of movement. The garment schematic of Winter Doldrums tells me that the size I chose based on my bust has a depth of 9.25″ in the yoke. Decisions! How much length do I reduce, if any at all? How will that reduction in length cascade issues throughout the rest of the yoke? In this particular case, let’s say I want to take 1.25″ from the yoke depth. I’ve picked the size based on my bust measurement; I’m happy with the 35.5″ because I’ve decided I want a bit of a relaxed fit. Because of my own personal tastes, I’d considering making the waist about 3″ smaller. But that means I have to read through the pattern and see where the waist goes; the charts above tell me that the CYC sizing chart (which I know Knitty uses!) assumes my waist is 2″ away from where it actually is on my body. That’s a BIG difference when it comes to how a sweater sits on your body! When I make those decisions and move up to the yoke, I now have to really consider how I’ll take out that 1.25″. The gauge says it’s 6 rounds/1″. So, I need to remove about 7 rounds. That doesn’t sound like a lot, but don’t forget about the beautiful colourwork! I could try to sprinkle those removed rounds up the chart, avoiding the decrease rounds, but it would be a good idea to draw out on knitter’s graph paper what the chart will look like if I do that. I might decide it interrupts the flow too much. Another consideration I would have to make (and one common to petites) is narrowing of the shoulders/upper back. I might be tempted to just take out one whole repeat of the colourwork, but in this gauge that ends up being almost 4″. Taking those 4″ away at the base of the colourwork, around the upper arms and shoulders, would be something you’d have to consider even before approaching the bust measurement; I’d have to think about it way down at the waist, and before I even start the sleeves! Remember: I picked a colourwork yoke sweater to show a complicated example. Please don’t let this keep you from looking at one for yourself! This is certainly something you can work out with some math and patience. We’ll be looking more at that next week when we talk about math, (im)modifiable design features, and your own personal taste. Warning: PLEASE read above in Accurate Body Measurements! Here, I’ve listed a few very general suggestions of what petites can consider in regards to modifying fit. I hope that by now, you know the philosophy behind the #KnitPetiteProject is that this is a body positive, non-judgemental community that accepts and supports the individual tastes, styles, and fit preferences of each #KPP person. So you understand why I’ve hesitated to include that last section of suggestions from the Soto article. 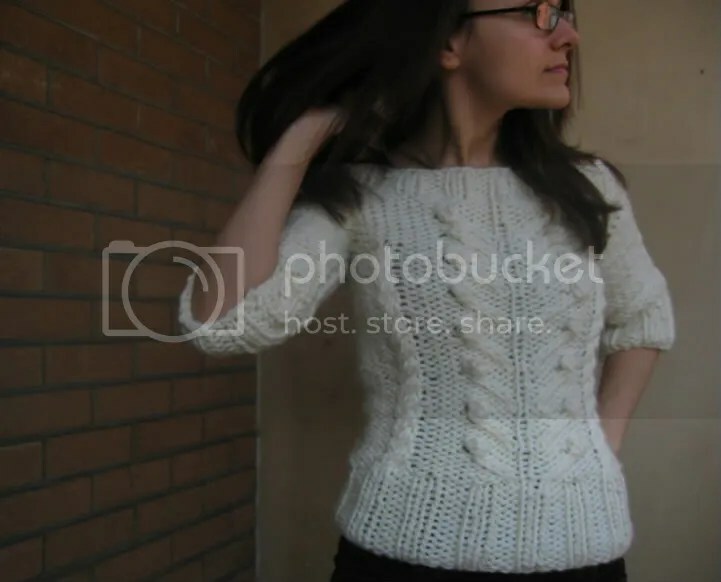 Bulky yarn sweater: a mistake for petite folks? What do YOU think of this list? I know I’ve played with bulky yarn in the past. Here’s a photo and 2008 blog post as proof. Was that a mistake? Does it “downplay” my figure as a petite woman? I think that’s entirely a subjective point of taste. Let’s move on to another set of guidelines, again from an expert in the sewing world. This general list for petiteing tactics comes from the the website Madalynne, created by lingerie designer, sewing teacher, and personal stylist Maddie. She’s kindly shared this handy chart that shows how, in the sewing world, petite sizing is different from regular sizing. Keep this chart in mind, as we’ll be talking more in depth with what the world of sewing can teach us knitters. For now, consider: does this chart reflect the comparison between your own measurements and the CYC standards? This is not the quick advice you might have been looking for! Mathematics and knowledge of your own shape and numbers is important, but also important is testing out some modifications with your own two needles, and understanding that this may require trial and error. will stacking these decreases this close together look weird? do I really dislike this technique? Am I going to really dread knitting this pattern? are these needles and this yarn a good pairing? what happens when I block it? (and particularly for my example of Winter Doldrums): will this truncation of the colourwork look ok? How do I feel about the look? As always, the #KnitPetiteProject is here to be as accurate, inclusive, and collaborative as possible. Do you have some advice? Know of a source we should add to this post? Please reply here or, better yet, continue the conversation over on the #KnitPetiteProject Ravelry Group. What general list of petite modifications have you seen? Please share it on the #KnitPetiteProject Ravelry group! This quote is inserted here because it is a great demonstration of the information and detail given to you as a petite knitter in Ysolda’s Little Red in the City book. While there’s no specific “petite-centric” discussion, you can absolutely find many bits of information that will help you understand design-important details for modifying the fit of your sweaters. You will have to understand what you need to alter, but once you do know that (through measuring, looking at charts, and your lifetime of buying and making clothes!) Little Red is an excellent source of fitting for petite folks. 3 Madalynne. How to make a pattern Petite. July 1, 2013. ← #KnitPetiteProject: What to look for in a knitting pattern; hallmarks of a design you can modify.